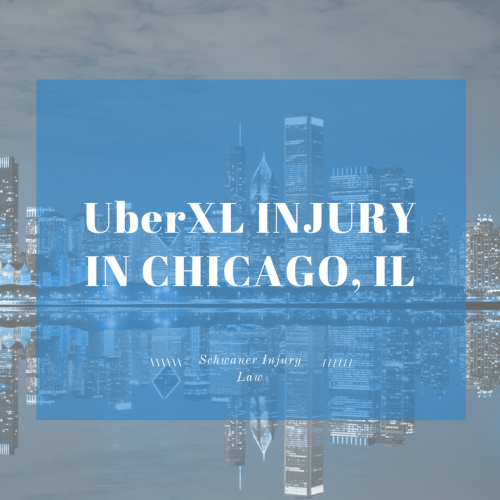 Were you hurt in a UberXL car accident in Chicago? We’ve got your back. Chicago is one of the busiest cities in the country, with seemingly non-stop traffic. During rush hour, a 15.9-mile stretch on the 1-90/1-94 interstate is listed as one of the worst areas for commuters in the nation, with traffic slowing to painful 3.08 minutes a mile. (To put that into perspective, the current world’s record for running a mile is 3:43.13, set by Hicham El Guerrouj of Morocco in 2010). “There’s nothing more frustrating than dealing with traffic,” Chicago resident Mario Reed told the Daily Beast in a story listing the worst areas for rush-hour traffic in the country. Were you Riding with UberXL and Got into a Car Accident? Were You Injured by an Uber Driver in Chicago? Are Ridesharing Programs Like UBerXL Safe? In a heavily traveled urban area such as Chicago, Uber drivers are often fighting for passengers, especially so in busy areas such as Wrigley Field, Steppenwolf Theatre, the Chicago Museum of Art and other heavily populated areas where traffic could be heavy. Heavy traffic and lot’s of pedestrians and hazards can make driving dangerous if a driver fails to stay focused or is tired. UberXL drivers usually use a dashboard-mounted phone with an app that shows those drivers where potential passengers are located, sometimes with a ping or also with a pop-up alert that announces that a potential fare is nearby. Both methods of messaging can be distracting, and drivers could create an unsafe driving situation if they use the app while on the road in order to reach the fare before another driver. Since its inception in 2009 in San Francisco, Uber has expanded worldwide, and now serves more than 500 cities. UberXL services are more limited, but they allow for extra passengers and luggage for travelers who are unable to pack light. The system is simple. A passenger or group of passengers in need of rides download an Uber app, which then sets them up with any Uber drivers in their area. They then can book a ride via the app, which then sends information about the car and driver. UberXL enables passengers to fit more luggage and bring more friends along in the ride. While UberXL drivers in Chicago are required to carry insurance in compliance with state and city laws, there is a chance your driver might be underinsured, with coverage that won’t adequately compensate you in case of severe injuries in the event of a car crash. If you got into a car accident while riding UberXL or were hit by a UberXL driver, you may be entitled to compensation for your injuries. Uber offers $1 million in excess liability insurance coverage through James River Insurance Company (the same insurance company that covers Uber’s competitor, Lyft) that is in effect from the time a driver accepts a ride request until the ride is ended. The coverage is in place because many personal auto insurance policies are voided when drivers, independent contractors as far as UberXL is concerned, are using their vehicle in order to make money. If you were injured in a crash while riding as a passenger with an Uber XL driver or while an Uber XL driver was distracted on the road, it’s important to secure legal representation to help you navigate the relatively new legalities involved with the ride-sharing industry. According to UberXL, insurance coverage is structured in three parts. Drivers are covered by their own personal auto insurance when they are not at work, are covered by their own insurance and UberXL’s contingent liability coverage, which includes up to $50,000 per injury and $25,000 in property damage, when they are driving with their app open but don’t yet have a fare. If drivers have a passenger, they are covered by Uber’s $1 million liability coverage as well as a $1 million uninsured/underinsured policy, in case of an accident with a driver without adequate insurance. In addition to a car crash, there are certain safety issues associated with Uber, UberXL and the luxury Uber service Uber Black, which offers limos or high-end vehicles, according to Marxian economist Richard D. Wolff, who compares the ridesharing service to taxi services when they first began. Uber is able to charge less, Wolff says, because they are operating under looser regulations than taxi drivers. Eventually, however, in the same way regulations were put in place to protect taxi passengers, UberXL and other ride-sharing services may eventually face the same regulations if safety becomes a concern. In 2014, one of the most recent years with available statistics, there were 107 fatalities on Chicago roads involving 165 vehicles, approximately 3.5 percent of the total 32,675 total vehicular deaths that year. In 2015, an Uber van driver collided with a police SUV outside of Chicago’s famed Wrigley Field (home of the recent World Series’ winners the Chicago Cubs), injuring the UberXL driver, five passengers and the officer, who were all transported to the hospital with minor injuries. The UberXL driver was cited for failing to yield the right of way and damage to public property. The passengers of the UberXL minivan were lucky they escaped virtually unscathed. Earlier this year, weather triggered a 35-car pile-up on Chicago’s Kennedy Expressway, leaving seven people seriously injured and numerous vehicles including two Ubers seriously damaged. The accident was attributed to lake effect snow and ice as well as low visibility due to blowing winds coming off of Lake Michigan. Ridesharing programs, especially ones like UberXL, which can carry from one to six passengers in SUVS, is one way to reduce traffic congestion and get from point A to point B. According to a study by Harvard Business Review, if just 15 percent of solo drivers used a ride-sharing service, it could save $21 billion dollar a year related to congestion costs. But are they really safe to use? With so many users injured in UberXL and Ridesharing crashes, the risk is there. In Chicago, vehicles must be a 2002 or newer. UberXL drivers must have a four-door SUV or a minivan. Vehicles must be in good condition with no cosmetic damage and must be able to pass a vehicle inspection. Both official and temporary vehicle registrations are accepted, and the vehicle does not need to be registered in a driver’s name to qualify, suggesting that rental vehicles can also be used as UberXLs. Drivers must carry their own insurance policy that complies with Chicago and Illinois laws, although Uber also carries automobile liability insurance as supplemental insurance. But just as with any other vehicle service, there are risks involved when using an app to hire an Uber. In the event of an injury, having the right attorney – one with experience in handling ride-sharing cases and a deep understanding of the laws governing insurance regulations – will help determine whether Uber’s insurance or your driver’s insurance (which usually rejects claims if a car is being used for work) will be held responsible for covering your claim. A good lawyer will also help ensure that you secure a fair settlement that will cover any and all expenses related to your injuries.